Microsoft Exchange Server is vulnerable to corruption and damage. As a backup alternative, there is a need to save user mailboxes as PST files. Moreover, there are requirements when an organization might need to extract EDB file data to Outlook PST on a short notice without bringing down the enterprise Exchange Server. Till Exchange 2003, ExMerge is a utility that can extract EDB file data to PST. From Exchange 2007 onwards, Exchange Management Shell cmdlets namely, Export-Mailbox cmdlet and Import-Mailbox cmdlet are used. The only drawback is that these utilities support only specific versions of Exchange and can not carry out online EDB to PST Conversion. In order to convert Exchange EDB to PST online, third party utility must be deployed. Using Stellar Phoenix EDB to PST Converter, online EDB to PST conversion can be performed easily in just a few simple steps. 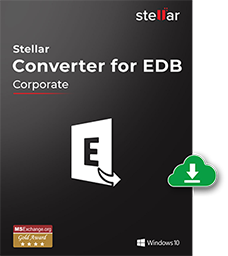 To convert EDB to PST online, launch Stellar Converter for EDB software. The main interface window will open. The screen offers two options: Offline EDB and Online Exchange. Choose the second option 'Online Exchange'. Once you have selected the 'Online Exchange' mode, the two 'Connection Options' appears. It gives the option to either connect to a single mailbox or connect to all the user mailboxes present on the server. If the online EDB to PST Conversion is to be performed on a single mailbox, then choose the first option to connect to a single mailbox and proceed. However, if multiple or all Exchange mailboxes need to be converted to Outlook PST, then, choose the second option to connect to all the available mailboxes present onto the server. In order to connect to a single mailbox, choose 'Connect to single mailbox' option and specify the Microsoft Exchange Server Information and click 'OK'. For MS Exchange 2007, 2003, 2000, or 5.5 provide the Mailbox Name and Server Name. However, if you are using Exchange Server 2010/2013, provide Email, Server Name, and User Password. Another window displaying the status of the selected mailbox will appear. If you choose to connect to all the mailboxes on the server, choose 'Connect to all mailboxes on server' option and provide the MS Exchange Server details. Type the Admin and Server Name for MS Exchange 2007, 2003, 2000, or 5.5. If you are using Exchange Server 2010/2013, provide Admin Email, Server Name, and User Password. A window displaying the status of the available mailboxes on the server will appear. In case of choosing multiple mailboxes to be converted from EDB to PST online, some mailboxes might appear as disconnected. The reason behind this is the fact that for some mailboxes, the user might not have 'Full Mailbox Permission'. To grant the required permissions for disconnected mailboxes in Exchange 2007, 2010, and 2013, Stellar provides 'Stellar Phoenix Server Console.exe' that grants the administrative rights and permissions. After granting the mailbox rights and permissions, the software window opens that contains all the user mailbox items to be previewed in a three-pane view. On choosing the desired mailbox folders, the items can be viewed in middle section of the window. This feature helps the user to get a clear idea of the items that the software can convert into PST for a fair competency judgment of the tool. After selecting the desired mailbox (es) and items to be converted, simply right-click on it and select 'Save As' PST, to save the mailbox in PST format. The user can save the file at a location of his choice.